5.1 Segment "Love for Sale"
Set in the future, when buying and selling memory is common, a man (played by Gang Dong-Won) attempts to retrieve his memory of lost love and his ex girlfriend (played by Song Hye-Kyo). A Thai queer spy comes to Korea and falls in love with a Korean man. Similar to recent omnibus films like "Tokyo!" & "Chengdu, I Love You," the movie "Camellia" will be an omnibus film centered around a city (in this case the port city of Pusan, South Korea). Japanese director Isao Yukisada stated that working on the "Camellia" is a payback to the city of Busan and the Pusan International Film Festival, which screened Isao Yukisada's 2000 film "Sunflower" and selected that flm as that year's New Currents Award winner. This helped launch Isao Yukisada's career onto the international arena. 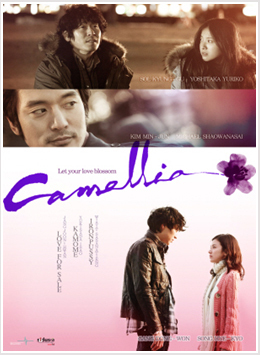 Pusan International Film Festival director Dong-ho Kim will act as producer for "Camellia". Production budget for each segment is 500 million won ($421,229). Filming began January 15th, 2010 and concludes March, 2010. As soon as production wraps up organizers plan to submit the completed film to the Cannes Film Festival (May) and the Venezia Film Festival (September). Early working title for the film was "부산 프로젝트" (Busan Project). daisy Jun 13 2013 2:10 pm And now we're in mid of 2013, when is this movie going to release? Dexter Nov 20 2012 12:45 pm Release Date please?... Joon-Hwang Jang has such a small body of work, that this need to be released and seen by the world!!!! Jov Sep 25 2011 12:23 pm The release date will be on November 2011. I'm dying to see this one especially Love for Sale, of course my Wonnie!!! SMS Aug 15 2011 8:26 am I want to watch it too! When it is going to be released please??? Camellia Aug 02 2011 8:04 am Does anyone know when this movie is going to be released? I want to watch it so bad! Kang Dong-Won LOVE!